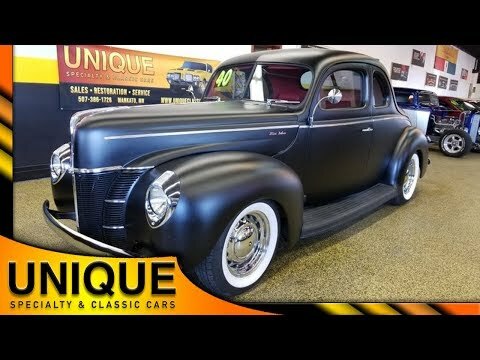 1940 Ford Deluxe Coupe Street Rod, all steel! Must see! TRADES? 1940 Ford Deluxe Coupe Street Rod finished in satin black paint. Again this is correctly applied PAINT, not primer. Underneath the hood is a new Chevy 350 crate engine installed paired with a Turbo 350 automatic transmission. All steel body. Power steering, power brakes, and air conditioning. Riding on wide whites with the artillery wheels in chrome. Very nice to take down the road. Chrome and the brightwork are all in great shape. Red vinyl interior. Seats are out of a newer mustang. Power seats. Power windows. Carpeting is also brand new. Stock looking dash and VDO gauges. Cruise control. Great fit and finish. Great running and driving street rod.